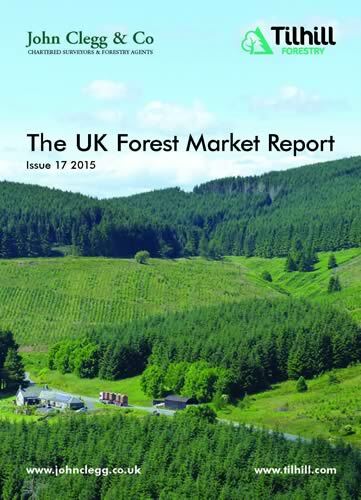 Tilhill Forestry has joined forces with John Clegg & Co to launch this year’s UK Forest Market Report (FMR) which gives both the buyer’s and seller’s perspective on the UK forestry property market. The FMR showed that a record £151.15m of productive forests were traded last year as the sector becomes an increasingly main-stream investment. In total, 98 properties comprising 18,435 hectares were sold. During 2015, UK timber production also reached a new record, with a total harvest of 11.4 million tonnes, driven partly by standing timber prices, which were the highest they have been in real terms since 1998. High timber prices have contributed to the continued increase in average property price. The UK timber processing industry has continued to invest in new capacity and ‘value added’ processing. Some 40,000 people are now employed in UK forestry and primary wood-processing (Source: ONS), making this an important employer, especially in rural areas. Despite this, the UK is still one of the world’s largest timber importers, importing almost 80% of its total timber needs (Source: ONS). “UK forestry has some of the highest environmental standards in the world and woodlands planted for timber production have multiple uses including recreation and conservation. The UK is the third largest timber products importer in the world which presents a tremendous opportunity for home grown timber. The findings of this year’s Report were revealed by experts from both companies at conferences in London and Edinburgh this month. “We’ve concentrated on commercial conifer forests which, in an area of low interest rates, provide a sound asset class underpinned by land ownership and real physical growth in the crop. The UK has world leading timber processing industries and meeting their demands for raw material provides a ready market for timber. Forest ownership is a simple and enjoyable investment in sustainable, green assets. Recorded prices are higher in England ranging from £10,800 to £12,800 per hectare compared to an average of £8,497 in Scotland. In Wales prices have increased by 23 per cent to an average of £9,162 in 2015 compared to £7,077 in 2014. Jason Sinden, Head of Investment and Property, Tilhill Forestry reminded the audience that over the last decade, the average annual return from UK forestry has been 18.8%, beating a range of other investment classes (source: IPD). “UK forestry is a great long-term ‘green’ investment, and with the increasing use of ‘forestry funds’ is now readily accessible to mainstream investors. Tilhill Forestry manages more woodland for more woodland owners than anyone else in the UK and, with a network of offices throughout the UK, the company can provide a professional local service to farmers with the added benefits of the support and buying power associated with being a national company. Tilhill Forestry Ltd, established more than 65 years ago is a national company operating from a network of offices throughout the UK. The company provides a full range of consultancy and contracting services to the forest owner and forestry investor. The company has reputation as forestry and woodland specialists and sells and buys well over 100 properties per year from its offices in England, Scotland and Wales, as well as providing consultancy advice to clients on their existing woodland holdings. Clients include private individuals, institutional and private funds with significant land holdings, traditional rural estates, government agencies and a variety of companies. Woodlands sold or acquired range from a handful of acres to thousands of acres and from amenity/conservation woods to pure commercial coniferous forests.